In a potential move to compete with Google‘s developing ‘Google Fiber’ super-fast internet service, American telecommunications giants AT&T are said to be proposing a ‘major expansion’ of their competing service, with designs on covering as much as 100 municipalities within 25 metropolitan areas across the country. 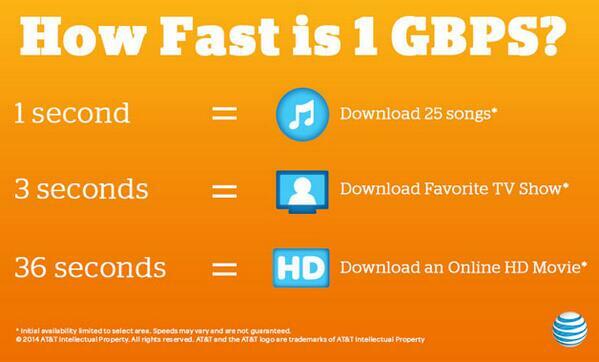 The service from AT&T, known as GigaPower, carries a 1 gigabit/second speed cited as being 100 times more powerful than the national average, leading naturally to much more seamless downloads of content including videos and the capability for more connected devices to share the network signal with minimal impact on overall speed. Whilst currently only operating this function in the Texan city of Austin (USA) and a commitment to expand to nearby city Dallas, AT&T are also in ‘advanced talks’ to propose roll-outs of GigaPower in two markets of the state of North Carolina, in the form of Raleigh-Durham and Winston-Salem. 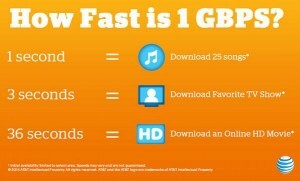 Beyond that, AT&T claim further expansions of their ‘symmetrical’ service (designed to have equal download/upload speeds) will be dependent on discussions with relevant city officials and an assessment of local demand for such a service, though they will limit themselves to areas in which they have landline operations, primarily the south of the USA. Of course, should AT&T want to go even further with their ethos and target a little extra broadband power in anticipation of future demand, then you can be fairly sure their internal researchers could squeeze out an extra, say, 21% to bring a total speed of… what?